Do you want to improve your social media marketing? Have you looked at how your competitors are using social? There are tools to help you determine what’s working for you and your competitors, what isn’t working and why. In this article you’ll discover four free tools to compare your social media presence with your competitors’. 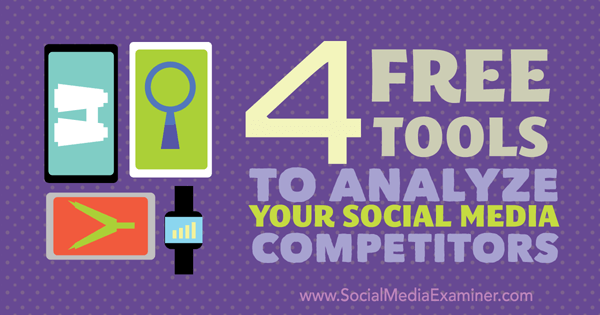 Discover four free tools to analyze your social media competitors. Fanpage Karma will analyze your and your competitors’ accounts across Facebook, Twitter, Google+, Instagram, YouTube and Pinterest. However, its most robust and useful features fall within the Facebook realm. 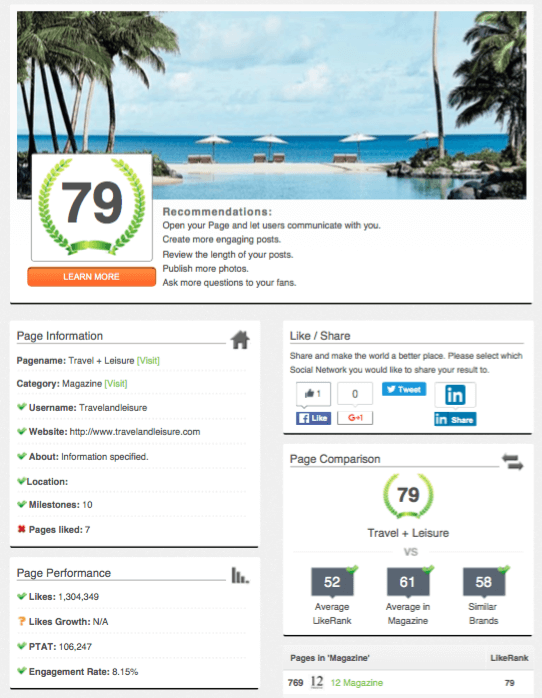 The free plan offers a detailed, 90-day analysis for one page and a comparative dashboard for any number of competitors. The free plan will also send you weekly reports and alerts if you so choose. 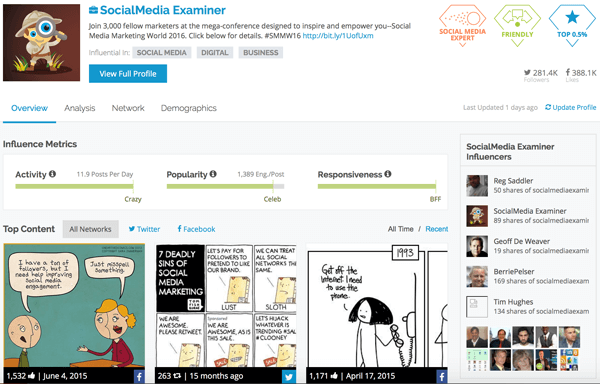 Compare your social profiles with those of your competitors. The free comparative analytics cover engagement, growth, most-used content sources and keywords, top posts, frequency, engagement by day and time, post type and supporters, among other metrics. 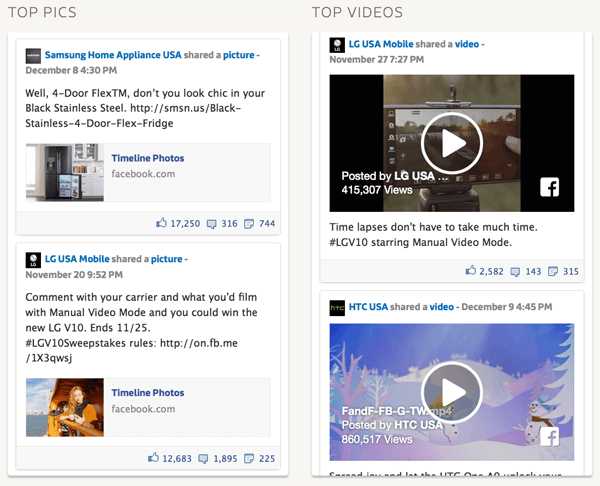 Get detailed content metrics, including top pics and videos. 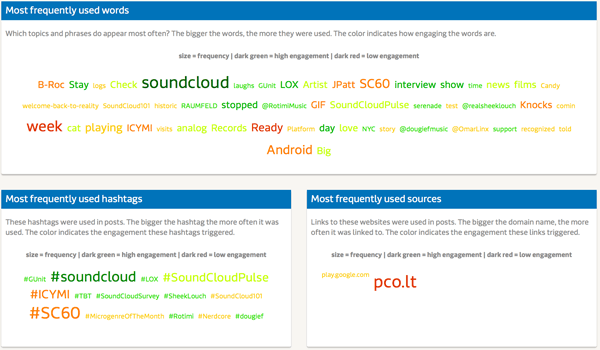 The detailed analytics tack on keyword and content source engagement (via a color-coded word cloud), post length, success by post type, influencers, post history and more. View the most frequently used words, hashtags and sources. You have to use the premium version to access analytics for other social networks, or for more robust analytics and exportable Excel and PowerPoint reports. These plans start at around $75 per month. The interface is unique in that it instantly displays comparative charts and graphs, allowing you to quickly and visually assess your page‘s strengths and weaknesses. Then dig deeper into the content types, timing and keyword tools to understand the why behind the data, and adjust your strategy accordingly. LikeAlyzer will do a quick health check of any Facebook page. The tool is commonly used for competitive research because it doesn’t require access to Facebook Insights to do its magic, and the features are uniform across pages. Though it doesn’t present a side-by-side comparison like Fanpage Karma, the data is presented in a friendly enough way that you can easily take screenshots and import multiple analyses into a document for a competitive comparison. LikeAlyzer uses its own scoring system to assign each page an overall rank between 1 and 100, as well as averages within industry and similar brands. It will also give you metrics including likes, growth, engagement rate and PTAT (People Talking About This). Each of these metrics is accompanied by a green check mark or a red X, indicating whether the metric is strong or subpar. Get a detailed assessment of Facebook page performance. Additionally, the tool will check on different elements of your page by measuring responsiveness, timing, post type and page information (using the same check mark and X system). It also provides suggestions to improve the health of your page, such as what types of content you should focus on and when to post to get the strongest engagement. LikeAlyzer is excellent when you want to perform a quick check on your page, but you’ll get the most benefit from it if you use it to analyze multiple competitors. Pay close attention to suggestions the tool spits out for other pages to determine where your brand can step up and take the lead. Klear, formerly Twtrland, serves as both an influencer-identification platform and an analytics dashboard. Search for influencers by skill and/or location and Klear will generate 10 influencers in multiple categories (celebrities, power users, casual, etc.). Upgrade to a pro account to see more results, starting at $249/month. 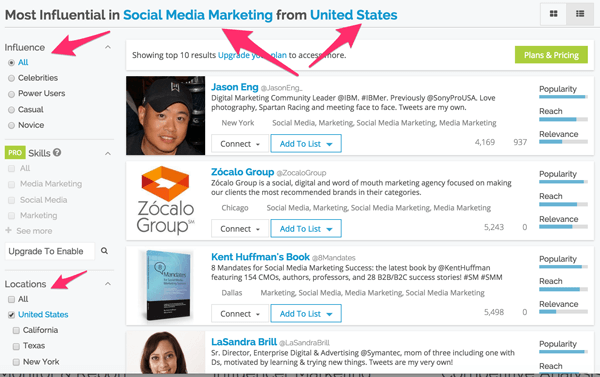 Search for influencers by skill and location. 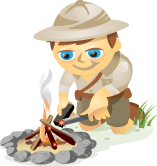 You can view anyone’s analytics profile by searching for his or her name or visiting http://klear.com/profile/USERNAME. This powerful dashboard will generate the account’s top content on Twitter, Facebook and Instagram (if you manually add it). You can also see activity and responsiveness levels as well as a list of people the account most frequently interacts with. 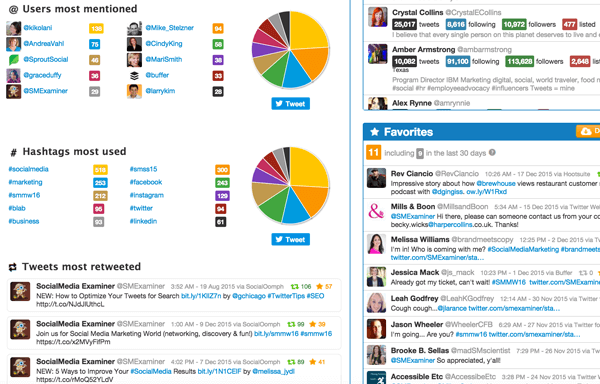 Get detailed analytics for anyone’s social profile. Click over to the Network tab to see a breakdown of who is following and engaging with the account by their influence level. The Demographics tab breaks down age, location, gender and interests, although you’ll have to upgrade to a pro account to see more than one or two insights per category. As an influencer-identification platform, Klear is one of the best out there for building influencer and outreach lists. It’s also a fantastic option for auditing competitor accounts. Its top content dashboard is visual and easy to read, and the audience analysis tools help you assess the quality, not just the size, of the audience the account is reaching. 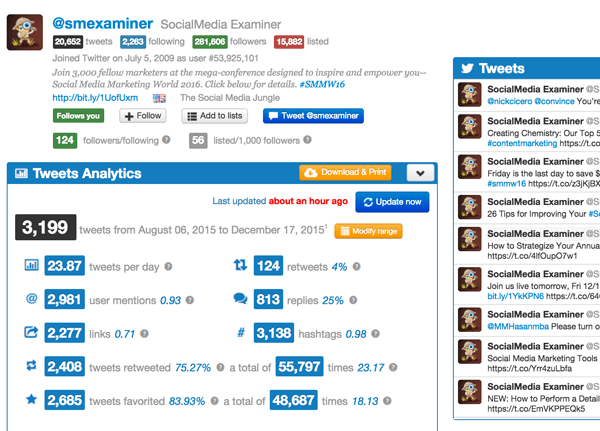 Twitonomy’s most powerful free feature is its account analysis tool. Sign in through your Twitter account, and then on the right side, you can opt to see the analysis for your account or any Twitter handle you choose. The tool will determine how many tweets to analyze. It’s usually a high number, often in the thousands, though the account’s activity level will determine how far back in time it goes. If the account doesn’t tweet very often, the analysis will cover a longer time frame, sometimes up to a few years. Upgrade to a premium account for $19 per month to set your own time frame. The analysis will generate a number of metrics including average tweets per day, total retweets and favorites. It will also break down how many of your tweets contained links, hashtags, mentions, replies and retweets. View a detailed analysis of tweets for any Twitter profile. Beneath your metrics, Twitonomy will show who engaged with you most often in the designated time frame in the form of retweets, replies and mentions. Then it breaks down the most retweeted and favorited tweets, and the days of the week and hours the account was most active. Look at engagement analytics for a Twitter account. With a premium account, you can download all of the tweets for any account from a designated time period. This is incredibly useful if you want to do your own data analysis, because it includes the retweet and favorite account. Or you can download your own tweets in the time period Twitonomy designates for free. The Mentions & RTs tab is functional only for the account you used to sign in, meaning you can’t use it for a competitive audit. Still, it gives you a useful snapshot of your most engaged and influential users. You can then click on and analyze their profiles. What I love about Twitonomy is how it efficiently displays all of the information you need to quickly assess an account‘s social media strategy. The breakdown of users the account engages with most often, coupled with the most used hashtags and top content allow you to get a handle on how the account approaches content creation and engagement. Now that you’re equipped with some of the strongest tools to audit your competitors’ presence across social media, the true power of these resources comes in aggregating what you’ve learned and setting up actionable goals to revamp your social strategy accordingly. Think about some of the top content you saw that blew you away. How can you emulate that on your own accounts? What about engagement metrics? Who was strongest, and what are they doing both in terms of outreach and content creation to outperform the competition? Since you’ll know who’s winning, figure out why and apply it to your strategy. The great thing about social media after all is that it’s social. Everything your competitors do on social media is public, and ready to be analyzed. What do you think? How will you use these tools to make your brand’s social presence stronger? We’d love to hear from you in the comments below. 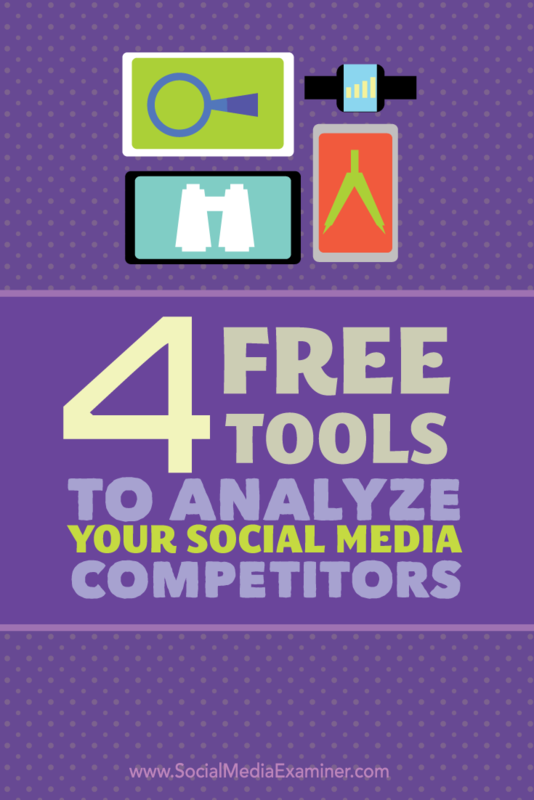 4 tools to analyze your social media competitors.